Brighstone Holiday Centre is set in the West Wight amongst some of the most picturesque scenery the Island has to offer. We overlook the beach and have easy, safe beach access. We can offer self catering, bed and breakfast, camping and touring caravan facilities and are happy to provide all forms of Isle of Wight holidays for the entire family. Last year we added 10 basic rooms for those on a strict budget, see price guide or ring 01983 740244 for details. Well behaved children and pets are always welcome, Sue & Clive will always try to help where needed and are flexible wherever possible..
Brighstone Holiday Centre is perfect for families, walkers, surfers and mountain bikers looking for self catering and bed and breakfast Isle of Wight holidays, Isle of Wight camping and touring holidays or an Isle of Wight park holiday. We are a short drive from Compton Bay offering the best surfing on the Island. If golf is your sport, a self catering holiday break at the nearby Freshwater course may be just the thing to relax, some of the best views of the West Wight are on view. 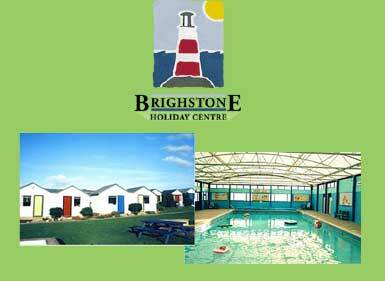 Brighstone Holiday Centre is a family run site that was originally built in 1932 and is possibly the only one of its type left in the country. Whilst we are trying to preserve the period charm of the site, we try very hard to provide clean modern facilities for all who stay with us. Recent additions are budget rooms, a seasonal take-away, more camping shower facilities including wheelchair accessibility and a functions room that can be used for family reunions, small parties, wedding receptions etc. All B&B rooms have their own en-suite toilet, shower and washbasin. Tea & coffee making facilities are supplied and refreshed daily. A full English breakfast or simple toast, fruit juice and cereals are served during the season. Individuals, families and groups can be catered for. The rooms have colour TV, dressing table, wardrobe and a mix of either 2 or 3 single beds or double bed and a single bed. The family room has a double bed and bunk beds. Self catering chalets have a fully equipped kitchen/dining room with electric cooker, fridge, radio, crockery, cutlery and all the usual cooking equipment. The separate living room has colour TV, settee, chairs etc. All bed linen is provided but we do ask that you bring your own towels. Electricity is supplied via a £1.00 coin meter. High chairs and push chairs for babies/toddlers are available by prior arrangement.